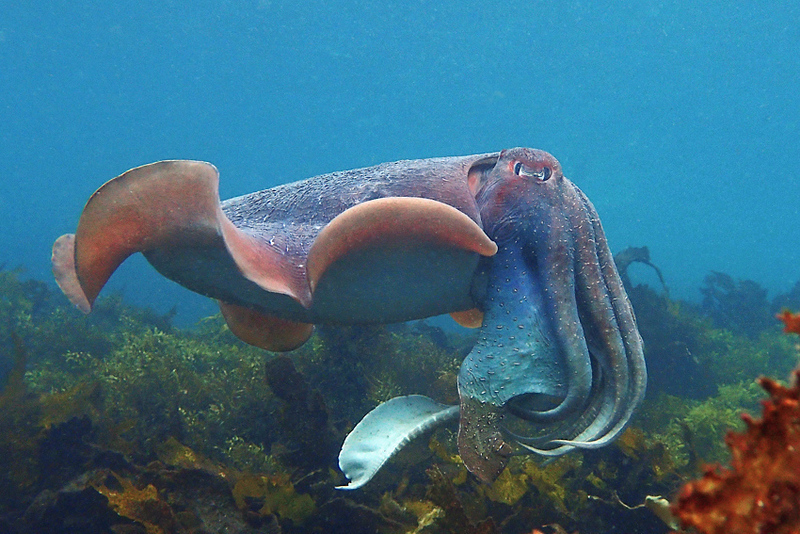 This has been a good year for giant cuttlefish at the Cabbage Tree Bay Marine Reserve, on the edge of Sydney. Animals have been coming and going since the beginning of the year, including some spectacular ones. 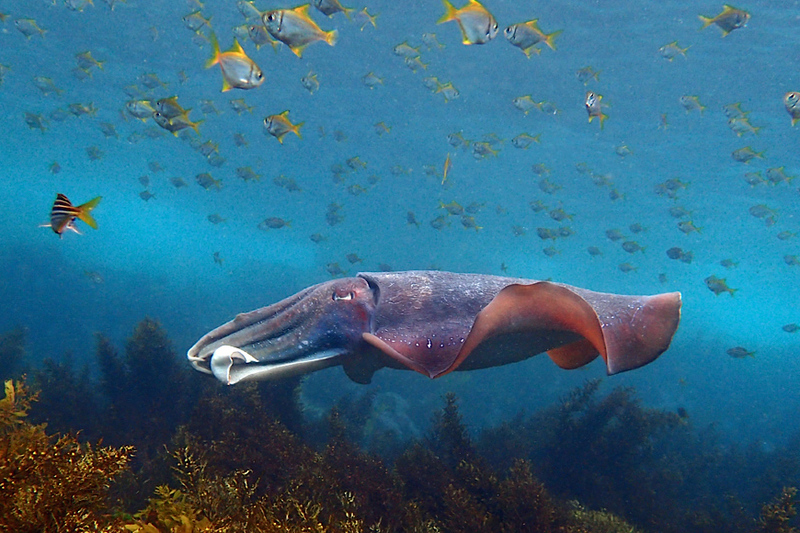 A few weeks ago I came back from a European trip to find the water bright blue and cuttlefish everywhere. These photos were taken using my snorkeling camera, an Olympus TG4, not the Canon I use diving. The colors are basically straight out of the camera – turned down a touch in some cases, as the TG4 tends to overcook things a little. * I don’t think I’ve ever seen the water here so clear and blue. It was a nice welcome home. 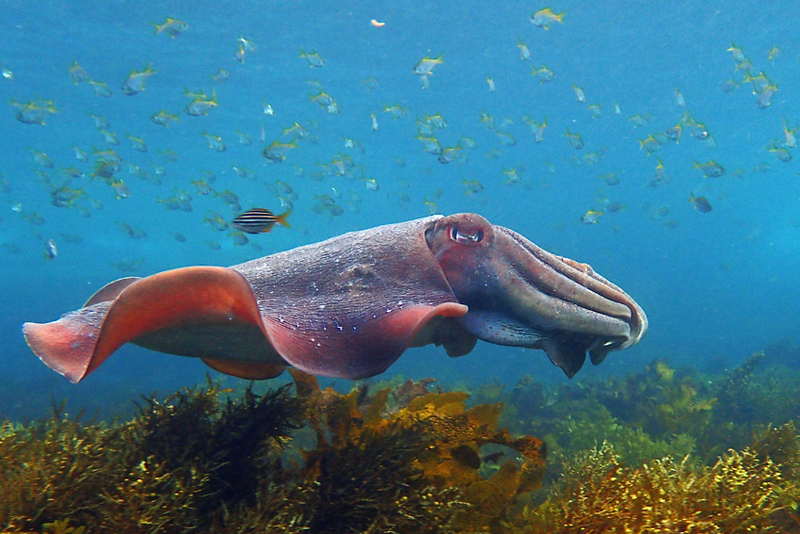 Early winter is the peak of the mating season for giant cuttlefish, both here and at the more famous sites at Whyalla. These animals are probably all males, roaming around in the middle of the day in search of mates. I saw one or two likely females on these swims, but it was mostly males who were out and visible. The colors on females are a bit more muted and their outer arms are more compact. This one below might have been quite a photo, if not for that errant bit of seaweed. * More exactly: the saturation is not pushed up. I do typically under-expose and then push the exposure back up afterwards. Here on instagram is one taken a week or so later, with the Canon. The water by then was not quite the same. This male also has some early signs of their rapid aging. 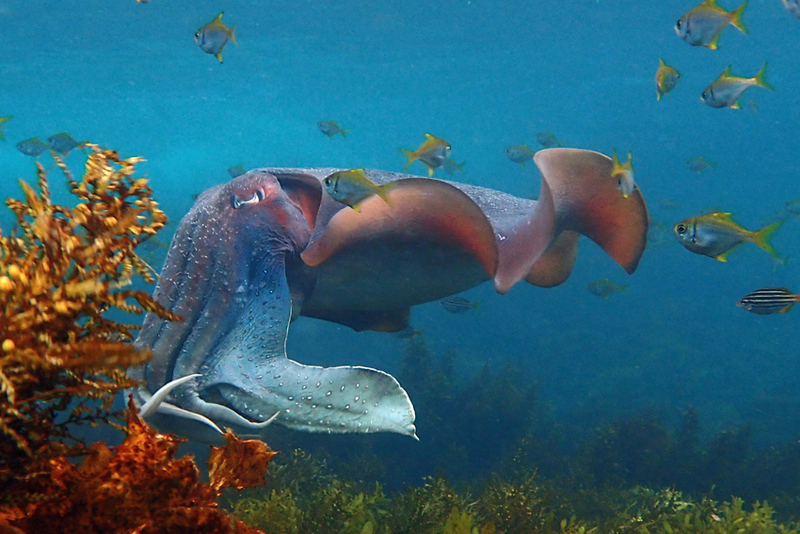 ** Further afield, here is a characteristically great shot from Alexander Semenov. And one more. 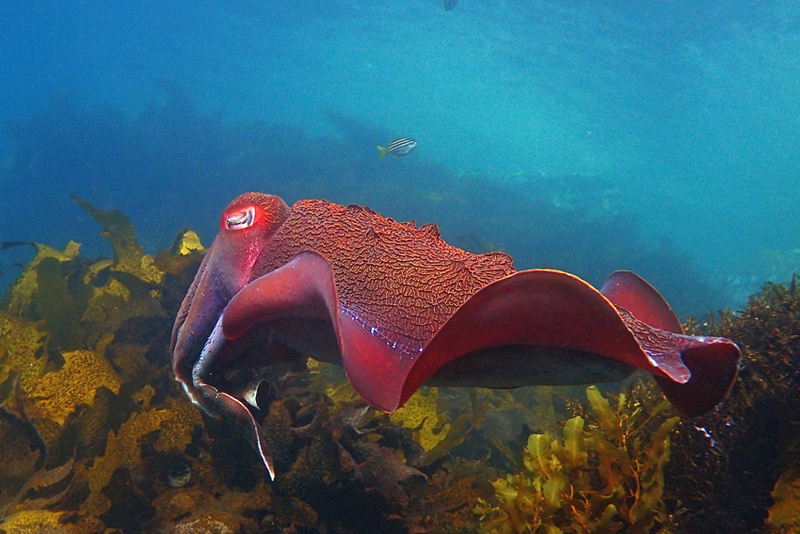 This entry was posted in Cephalopods, Color. Bookmark the permalink. Beautiful photographs as always! Hope you do another post on mating. Curious to know if there are many strategies employed by males and females in the same area; do they form pairs at all or is the whole thing more open? Thanks, Shreya. It’s often hard to work out exactly what is going on, and I don’t think anyone has studied natural mating behaviors in the Sydney population (in the way Karina Hall and others have studied the Whyalla one). Males roam around. When they encounter each other, they display and this seems to result in some individuals holding ground and others departing (at least temporarily). These interactions probably enable access to females. Females hang out under ledges quite a lot, sometimes in groups of three or so. I’ve seen females together with males swimming along (sometimes two females, I think). I don’t know whether there are ‘sneaker’ male strategies used, as they are at Whyalla, where smaller males impersonate females to avoid confrontation and get close to other females. This has been a good year and it’s been pretty busy down there; sometimes it’s quieter and there seem to be fewer interactions.